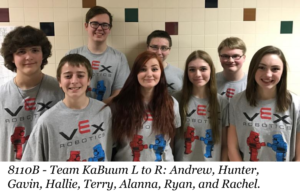 Rachel from VEX Robotics Competition Team 8110B filled the REC Foundation in on the challenges her team has faced as well as their hopes for the future. Rachel’s team, nicknamed “Team KaBuum”, is from Mankato, Minnesota, and she has been a part of the team for two years. We caught up with Rachel once more, just after her State Championship early this month to find out how things went. Her team had been working with Team Sierra and the Steel Phoenixes to form a possible alliance partnership when it came time for the elimination rounds. When the alliance came together she remembers feeling a little more confident going into the rest of the event. We wish Rachel, Team KaBuum, and all the teams who qualify a great experience at the VEX Robotics World Championship this April!